Congratulations to the East Coast ‘Eagals’ (as they love to call themselves) in winning their first ever game of footy by 33 points against Sydney Uni in Round 1 on April 1st 2017. Thanks to Andrew McMurtry at the Rouse Hill Courier who went with the following story in Monday’s paper. You can see the on-line version by clicking here. The East Coast Eagles women’s side has claimed a 33-point win in its first match in the Sydney AFL division one women’s competition on Saturday. Playing fellow debutants the Sydney University Bombers, a strong second quarter gave the Eagles a 25-point lead at half-time, eventually running away 7.17 (59) to 4.2 (26) winners. Inaugural women’s captain Sarah Ford said she was thrilled by the result. “I’m speechless, I just couldn’t be prouder of those girls,” she said. For Ford, who was voted captain by her teammates, said it was a huge honour to lead the team to its first win. Having been around the club for over a decade supporting her brothers, it was her first regular season game with only five of the Eagles boasting football experience. “To be able to be a part of it, not just as a supporter but as a player, is just amazing,” she said. 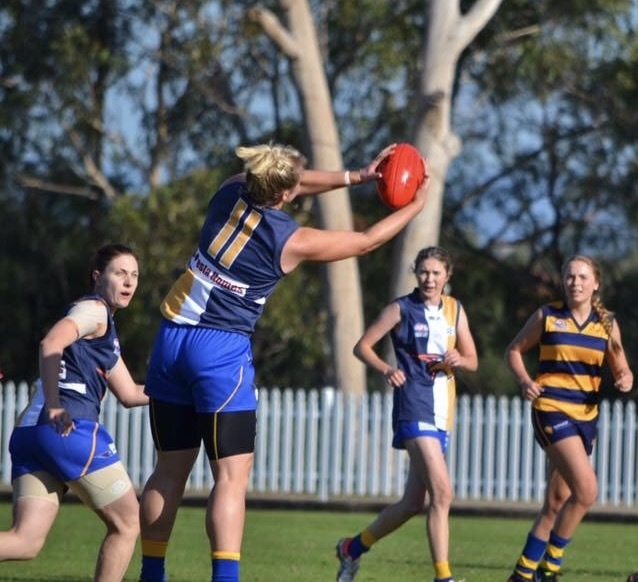 After the success of the national AFL Women’s competition earlier this year, club president Jon Gawley said an Eagles women’s team had been on the cards for quite some time. “There has been a growing interest in women’s footy for years,” he said. “I honestly think it will just grow and grow and it will complement the whole football club as well. With the women’s side kicking off the season with a win, it was a mixed weekend across the other grades with a huge 13.19 (97) to 0.1 (1) win over the South West Sydney Magpies in division four, but losses in all three other grades. The under-19’s side went down 12.15 (87) to 7.7 (49) to Sydney University, Reserve Grade lost 11.10 (76) to 10.7 (67) to the UNSW Eastern Suburbs Bulldogs and the defending champions in Premier Division were edged out 11.6 (72) to 10.10 (70) also by the Bulldogs.